On the evening of the opening stage on the 2009 Dakar, Alain Duclos was 210th overall due to tyre problems and his hopes for a strong showing were buried deep in the sand of the Pampas. His main mission of aiding Cyril Despres was also jeopardized when the team leader suffered the same hardship. Despite it all, the South American experience was enriching for the “part-time” rider, who got his chance to ride with the tenors of the category. “It was very instructive to experience the rally alongside Cyril. I learned what it means to be professional and disciplined”. This year, the Franco-Malian is back with the Toni Togo Team in the role of lead rider. After finishing 7th in 2006, Duclos isn’t worried about the uncertainties concerning the performance equivalencies between his bridled KTM 690cc and the smaller 450ccs he’ll race against. “The competition for the top positions is always hard fought. I have the feeling that at the end of the day, the mental aspect is still the most important. I hope I can finish in the top five. After all, I now have some experience and savoir faire…I am going to them all a hell of a run“, concludes Alain with just a lilt of humour. 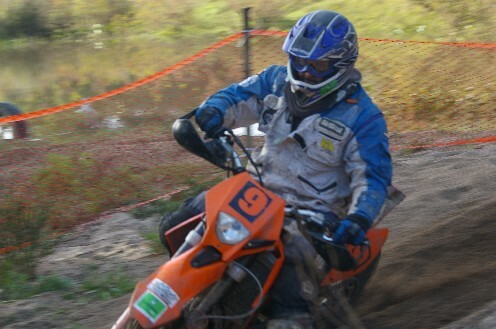 This week , i make mi presentacion of mi participacion at dakar 2010 in montevideo . It might well be a whole different ball game in the motorcycle race from now on… For many years, it was mostly an internal struggle between KTM riders, for a while split between the Spanish and French branches of the constructor. In the last few years, the contest was even down to an exciting showdown between Cyril Despres and Marc Coma, both solid pacesetters in the discipline. But the steady rise of under 450 cc machines led the organisers to opt for such bikes in the future, since they are now more reliable, reasonably cheaper, safer and far less thirsty than their more powerful counterparts. To make the shift easier towards an all-450cc field, top riders have been allowed to start this year with their 690cc bikes, on condition that their engines be equipped by an air input restrictor to curb their power. It remains to be seen whether the two double winners can retain their hold on the race under the new rules. Holder Coma and his arch-rival Despres have amply proved that they are peerless in terms of physical condition, riding skills and navigation. They will again be the leading favourites at the start in Buenos Aires. But the new deal will probably boost the ambitions of their rivals. Among them, David Fretigne will be closely watched after his third place last year on a 450 cc. This time around, he will fight on equal terms. The test will be one of mental strength and experience as well for the Yamaha rider. Apart from Yamaha and Honda, several constructors have already launched serious programs to develop 450 cc machines with the Dakar in mind. Italy’s Aprilia signed Francisco “Chaleco” Lopez, who is intent on taking his new colours to the very top. Chile’s Lopez will be on home ground in the Atacama desert. As for Frans Verhoeven, winner of two stages in 2009, he managed to convince BMW to return with a 450 cc. French team Sherco, who made a name for themselves on the enduro circuit, are eager to conquer the world of rally raid. They will count on David Casteu, 2nd in 2007 and 4th last year. 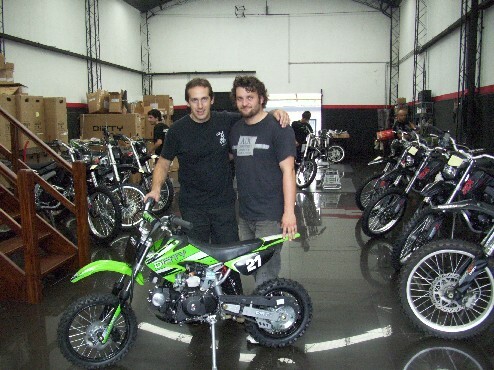 Mi sponsor DIRTY ( www.dirty.com.uy ) give me for move in the campement , a pit bike . This week i participe a second round off nacional enduro in ROCHA , i ride in 2 categories , i finish 3th in nacional mechanich , and 5 th in Pro class. The last stage, run in the form of two loops around Nefta, allowed Cyril Despres to pull away from his rivals and take his 3rd OiLibya de Tunisie ahead of Marc Coma, a little ‘lost’ first time around. The battle for the third place between the Spaniard Jordi Viladoms and ‘Chaleco’ Lopez finally went in favour of the Chilean for just 13 seconds – incredible after 11 days of racing… In the 450 class Olivier Pain achieved his goal and won his category after a hard fight with Bruno Da Costa and Luca Manca. After having dominated since the start of the rally, Lionel Laine wins ahead of Camelia Liparoti and the current world champion Karim Dilou. In the cars Orlando Terranova wins his first World Cup event at the wheel of his BMW X3 ahead of an incisive Christian Lavieille and his Proto Dessoude. Guerlain Chicherit puts the second BMW on the third step of the podium. 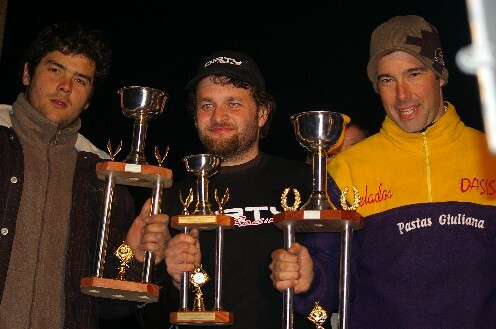 In the 2-wheel class Pascal Thomasse and his MD Buggy pips Jean-Louis Schlesser, while Jerome Pelichet takes the Wildcat Trophy. The Russian pairing of Varentsov-Elagin wins the T2 class. Finally Alain Coquelle, Frederic Becart and Dominique Lefevre take the truck victory. The end of 11 days of intense racing saw an explosion of joy. Right from the first loop this morning, Cyril Despres hit hard, taking advantage of a navigation error by his rival Marc Coma. On the second lap the Frenchman only had to control the situation to take the victory. The Spaniard finally finished 5’57 behind to take second place. Winning here for the third time, after 2002 and 2004, Cyril Despres was delighted with the result on a race of this quality. For the third place the battle was even closer. 4th yesterday evening, ‘Chaleco’ showed his tactical skill. Marking his rival Jordi Viladoms over the first stage he let him cross the finish line first. Then on the second lap, with the Spaniard in his sights, the Chilean attacked hard to win by just 13 seconds. In the 450 class Olivier Pain, very in form over these last few days, wins ahead of Bruno Da Costa, Luca Manca and the first lady home Virginie Premat. Mission accomplished for the 2008 winner , 9th overall. No last minute surprises in the quads. As since the beginning of the race, Lionel Laine won ahead of Camelia Liparoti, with whom he has run a team race these last few days. With the two KTMs in the first two places, Karim Dilou and his Yamaha made it to third place after a multitude of mechanical problems. In the cars Orlando Terranova made no mistakes to post his first victory on a round of the Rally-Raid World Cup – his BMW X3 running like clockwork over the 4500 kilometres. 38’20 behind, Christian Lavieille achieves a magnificent performance at the wheel of his Proto Dessoude N05. Finishing between the two factory cars, the Frenchman can be satisfied with his performance after having finished third in 2008. Guerlain Chicherit completes the podium. Winner on Abu Dhabi Desert Challenge last month, he increases his lead in the World Cup. A fine performance also from Nicolas Misslin who returns to rally raid with a 6th place. In the 2-wheel class Pascal Thomasse ‘steals’ victory off Jean Louis Schlesser whose new car is currently ‘a work in progress’. Artem Varentsov takes the first place in the T2 category in his Toyota ahead of Michele De Nora and the Mitsubishi Pajero of Christian Barbier, who announces his retirement from the sport after 23 years of racing. The Frenchman has however promised to return to help pass on his knowledge to the younger generation. 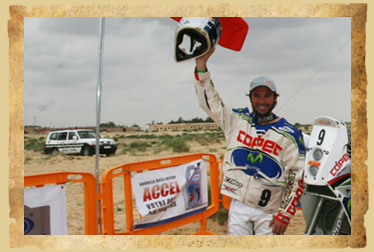 Jerome Pelichet, winner of the Wildcat Trophy, was delighted to have participated in this African rally. In the Open Class, victory to another Bowler, that of Pierre Lachaume. Finally in the truck class Alain Coquelle celebrates his victory in the T4 class with 38’19 ahead of Frederic Coudereau, followed by Sylvain Besnard and Richard Gonzalez. Renault ahead of Man and Mercedes. The 27th Rallye OiLibya de Tunisie was varied and demanding, both in terms of navigation and driving. An edition which continues in the great tradition of African rallies. 01/05/2009 | DUEL COMA-DESPRES …ANOTHER PODIUM FOR BMW ! The ninth stage between Oueni and the oasis of Ksar Ghilane saw victory in the bike class go to the Spaniard Marc Coma ahead of his principle rival Cyril Despres. The Frenchman conceded 4 minutes today but holds onto the overall lead two stages from the end. Third today, the Chilean Francisco Lopez firms up his third place overall. An excellent day for Olivier Pain who wins his third consecutive stage and retakes the overall 450 class lead from Bruno Da Costa who ran into mechanical problems. Lionel Laine continues his unbroken record with a ninth win in the quad category. In the cars the BMW X3s take the first three places with Leonid Novitskiy finishing ahead of Guerlain Chicherit and Orlando Terranova. Overall the Argentinan ‘controls’ Christian Lavieille, still second, while the Russian comes back to within 8’30 of the Frenchman. In the two-wheel drive category Pascal Thomasse still leads Jean-Louis Schlesser, while in T2 Artem Varentsov is virtually assured of victory. In T4 Alain Coquelle posts another victory. To get to the oasis of Ksar Ghilane, haven of peace in the heart of the palm groves, the competitors on the 27th Rallye OiLibya de Tunisie tackled a challenging 275 km special. Sandy pistes, jumps, stones, for certain bike riders the second half of the route resembled a mini enduro. In the cars the many jumps threw around the co-drivers. On two wheels Marc Coma wins ahead of Cyril Despres who is nevertheless still 5 minutes ahead of his principle rival. It will be very close between the two men and two stages from the end anything could happen. A little way behind them the Chilean Chaleco Lopez is simply trying to keep Jordi Viladoms at bay. Here also the gap is relatively slim and the third place on the podium far from a foregone conclusion. In the 450 class Olivier Pain has succeeded in getting back into the lead ahead of Bruno Da Costa who lost a good 30 minutes with chain problems. Luca Manca also had mechanical woes and losses more than 1 hour. A nice surprise for Christian Califano, who was met by his ‘teacher’ Cyril Despres, who turned back to evaluate his pupils progress. First Tunisian today Hassen Jemili enjoyed himself over the varied going. In the quad class Lionel Laine once again dominated, this time beating the Russian Vladimir Marugov into second place. In the cars the BMWs took the first three places ahead of Nicolas Misslin and Christian Lavieille. Out of luck again, the winner on this stage last year, Eric Vigouroux was forced to stop for 30 minutes to repair his alternator. A big disappointment for the Frenchman who’s Trophy Truck could have been made for this stage. Jean Louis Schlesser also ran into problems with his inflation system costing the Frenchman considerable time. In the Widlcat Trophy Jerome Pelichet holds onto his first place, once again posting the fastest time. In the trucks Alain Coquelle also takes another class victory. In parallel with the race, competitor Gaetan Ge was delighted to get to Ksar Ghilane to visit the herd of goats, sheep and camels that he and his friends bought and then handed over to Moktar Ben Omani. Thanks to this investment the tradition of farming has been maintained in the oasis. Tomorrow direction Tozeur… announced as one of the hardest stages of the rally, the final result is far from decided. On the menu: navigation, dune crossings, pistes cut by sand tongues, chotts, undulations and a finish at the famous Star Wars set. 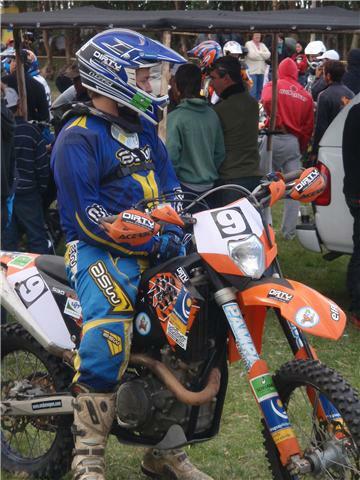 After 4 month out of ride , i come back i ride 2 enduro in uruguay , one in dolores i ride in 2 categorie , i finish 2nd in dirt bike and 5 in pro , the same result in the enduro of migues the last week. I happy to come back , i have a goog feeling on the bike. The first half of the marathon stage proofed very popular with the competitors. Sadly, today the second half between Oubari and Brack had to be neutralised. During the night a violent storm started to blow at the bivouac in Oubari making the crests of the dunes very difficult to see. This morning the decision was taken, in consultation with the competitors, to neutralise the special and send everybody to the bivouac in Brack by road. And for many, a bit of rest was very welcome after yesterday’s excursions. Yesterday only two bikes and a few cars failed to reach the bivouac in Oubari and were forced to spend the night out in the dunes. Located by the organisers in the evening, Stephane Clair went out early this morning to serve them a breakfast – room service in the desert! After a night shaken by the wind, this morning at 9h00 the competitors went to see the organisation and and race directors and asked for the special to be neutralised due to the poor visibility in the dunes that awaited them. A wise decision, as tomorrow, after having repaired both man and machine, everyone can set off again for the five remaining stages. OrlandoTerranova in the cars and Marc Coma on the bikes, race leader will have take great care against some extremely motivated challengers.